The Body Fat Breakthrough is written by Ellington Darden, PhD, an exercise researcher and pioneer of Nautilus fitness equipment. Dieters can lose up to 30 pounds in 30 days while simultaneously building muscle and gaining strength. The Body Fat Breakthrough program is designed for people who want to lose up to 50 pounds but can’t find time to exercise. You will only need to work out once or twice a week for 20 minutes on this plan to get results. The program advocates a meal plan where the majority of calories comes from carbohydrates. This makes the diet an appealing way to lose weight without having to give up your favorite foods. The level of carbohydrates is higher than many other weight loss diets. A higher intake of carbs enhances your ability to recover from the specific exercise techniques that are outlined in the Body Fat Breakthrough. A 6-week meal plan is provided, which consists of six small meals each day containing 100 to 400 calories. During the 6-week program the calories descend by 100 every two weeks. This gradual reduction makes your body become more efficient at burning fat. In weeks 1 and 2 women eat 1400 calories and men consume 1600 calories per day. The calories drop to 1300 a day for women and 1500 a day for men in weeks 3 and 4. In weeks 5 and 6 calories are further reduced by 100 to 1200 per day for women and 1400 for men. Body Fat Breakthrough recommends using frozen dinners for the first two weeks of the plan because they make portion control simple. You easily learn what 300 calories looks like without the need to weigh and measure. In weeks 3 and 4 fresh food substitutions are introduced which involve some weighing and measuring. Drinking cold water can increase your rate of fat-burning. Your body needs to use energy to warm the water and this causes consumption of extra calories. Water also assists with weight loss by supporting kidney function, eliminating constipation, and reducing your appetite. Dieters are advised to drink a gallon of ice-cold water every day. The foundation of The Body Fat Breakthrough is its unique exercise program using negative or eccentric weight training. Scientific research shows that this technique is one of the best ways to build strength and muscle. Recovery is also much faster after performing this type of exercise. Additionally it accentuates fat-burning by increasing the production of certain metabolic compounds. Because it is so effective it is only necessary to do this training for 20 minutes, one or two times per week. Also recommended is walking at a leisurely pace for 30 minutes after your evening meal. 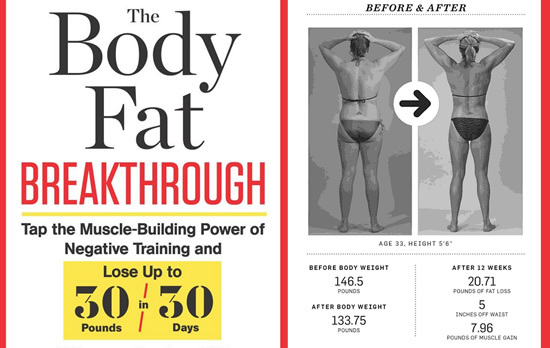 The Body Fat Breakthrough: Tap the Muscle-Building Power of Negative Training and Lose Up to 30 Pounds in 30 Days! retails at $26.99. Produces fast results with very little time required for exercise. Body Fat Breakthrough allows for a relatively high intake of carbohydrate foods. Includes a 6-week meal plan with recipes. Provides inspirational before and after photos of people who have had success on the program. Necessary to have gym membership and to use exercise machines. May be necessary to have a trainer assist you to be able perform the exercises as described. Requires the use of frozen dinners for the first 2 weeks, which may not appeal to all dieters. Body Fat Breakthrough does not offer options for vegetarians or dieters with food intolerances. The Body Fat Breakthrough allows for rapid fat loss with minimal exercise through the use of negative weight training. This six-week program can help dieters lose up to 50 pounds by working out just once or twice a week. However, adherence to the meal plan and calorie amounts are vital for success.